Each year, more than 75,000 wildfires destroy homes and damage wildlife habitats and the watersheds that provide drinking water for millions of people. Between 2004 and 2006, a whopping 37 percent of these fires were caused by campfires or smoking materials. Luckily, the USDA Forest Service fights wildfires in order to protect communities and necessary resources. However, you are the first step in wildfire prevention. The following tips can help your family have a safe and enjoyable vacation, no matter the surroundings. Before you even leave for your trip, it is important to be aware of any jurisdictional and RV campground fire regulations. This information can be found in a variety of ways such as contacting the local ranger station or reviewing campground websites. Next, you will need to pick your campfire spot and be sure to avoid hazardous, dry conditions. Most jurisdictions require the use of existing fire rings or pits. All fires need to be in open, level locations and at least 15 feet from shelter walls, shrubs, trees or other flammable objects. Wind speed and direction also need to be considered. You should know how to prepare your campfire pit and build your campfire. Everyone in your party should be knowledgeable on the maintenance and extinguishment of your campfire. Never burn aerosol cans, pressurized containers, glass or aluminum cans in a campfire. These dangerous items may explode, shatter, or create harmful fumes. In addition to campfires, cigarettes can be especially dangerous if not monitored and extinguished properly. Finally, teach children these safe fire practices and never leave children or pets unattended near campfires. 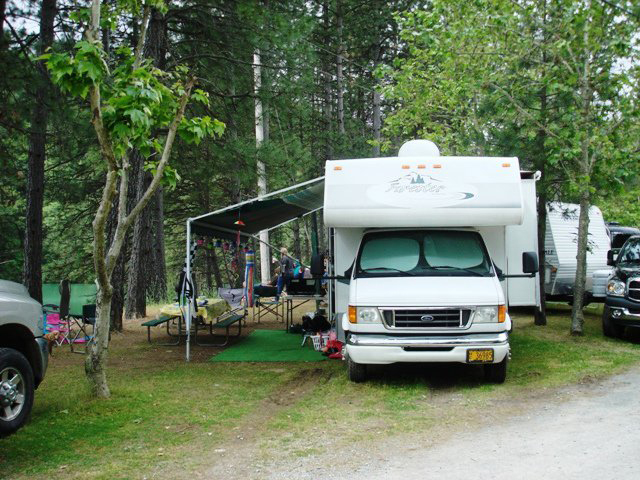 Wildfire prevention is key, but RV campers should always be prepared in case of fire emergencies. According to the National Park Service, there are 20,000 RV fires reported each year. The number one step to preventing a dangerous RV fire is to double-check the shelter’s propane tank for safety. This should include making sure that older tanks have overfill protection devices. Travelers should never travel with stoves, ovens or heater burners lit. The propane intake and exhaust should be cleared of any blockages. 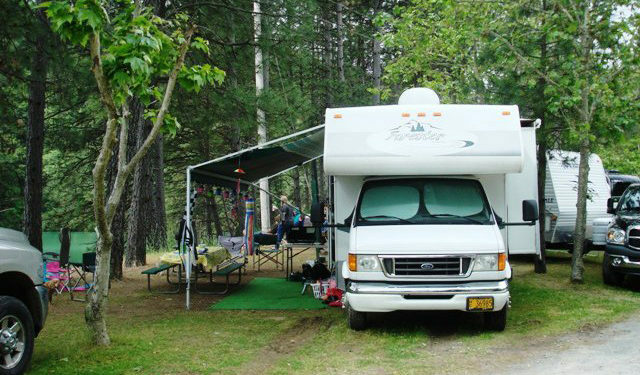 All RVs need to have three fire extinguishers on board with one located in the kitchen, another in the bedroom and a third stored outside in an unlocked compartment or in the tow vehicle. It is always advisable to be sure that everyone of logical age knows how to use onboard appliances and is aware of gas, electrical, and water shutoff locations. Be sure to test your smoke detector and check your campground electrical supply cord for condition and electrical load suitability. 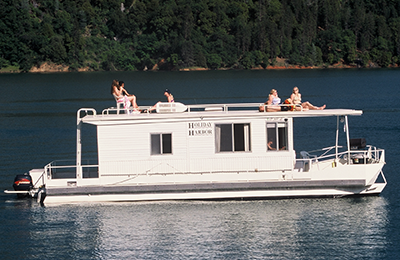 Lastly, campers must always turn off all exhaust fans and 12-volt lights when the RV will be left unattended. The USDA and National Forest Service are committed to wildfire prevention that keeps our nation’s forests and grasslands healthier. However, they are also keen on protecting the natural resources, especially clean water, that is provided by undeveloped lands. The National Cohesive Wildland Fire Management Strategy is working to build a framework that promotes resilient ecosystems, protects communities, and provides effective responses to wildfires. With your help, the nation’s federal, state, and local governments, tribes, and non-government organizations will be more easily able to provide the protection that our lands need.